Come together with fellow fundraising professionals for an open dialogue in a casual setting. 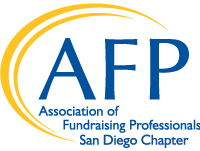 Join members of AFP San Diego for a free networking "brown bag" lunch series as we discuss ideas and resources for all of your small nonprofit needs. Bring your lunch and bring a friend to enjoy this conversation about setting realistic goals for a productive 2019. Open to all AFP members & non-members. Don't forget to bring your lunch!